The MC9060-G (MC9000-G Series) delivers an unsurpassed choice of scanning and imaging technologies. You can select an integrated high-performance laser barcode scan engine or a feature-rich, powerful imager, depending on your application requirements. The MC9060-G (MC9000-G Series) features an innovative mechanical design that withstands multiple 6-foot drops to concrete. Its IP64 sealing rating makes it virtually impervious to dust and moisture in environments where intensive barcode scanning takes place. Multimode wireless communication offers real-time access to data anytime, anywhere. Wi-Fi (802.11b), 2D Imager, Windows Mobile 2003, Monochrome Screen, 64MB RAM/64MB ROM, 53 key. Wi-Fi (802.11b), 2D Imager, WindowsCE .NET, Color Screen, 64MB RAM/64MB ROM, 53 key VT Emulation. Wi-Fi (802.11b), 2D Imager, Windows Mobile 2003, Color Screen, 64MB RAM/64MB ROM, 53 key, Bluetooth. Wi-Fi (802.11b), 2D Imager, Windows Mobile 2003, Color Screen, 64MB RAM/64MB ROM, 53 key. Wi-Fi (802.11b), 2D Imager, WindowsCE .NET, Color Screen, 64MB RAM/64MB ROM, 53 key. Wi-Fi (802.11b), Long Range 1D Laser, Windows Mobile 2003, Monochrome Screen, 64MB RAM/64MB ROM, 53 key 5250 Emulation. Wi-Fi (802.11b), Long Range 1D Laser, WindowsCE .NET, Monochrome Screen, 64MB RAM/64MB ROM, 43 key. Wi-Fi (802.11b), Long Range 1D Laser, Windows Mobile 2003, Monochrome Screen, 64MB RAM/64MB ROM, 53 key. Wi-Fi (802.11b), Long Range 1D Laser, WindowsCE .NET, Monochrome Screen, 64MB RAM/64MB ROM, 53 key. Wi-Fi (802.11b), Long Range 1D Laser, WindowsCE .NET, Monochrome Screen, 32MB RAM/64MB ROM, 53 key. Wi-Fi (802.11b), Long Range 1D Laser, WindowsCE .NET, Monochrome Screen, 32MB RAM/32MB ROM, 53 key. Wi-Fi (802.11b), Long Range 1D Laser, Windows Mobile 2003, Color Screen, 64MB RAM/64MB ROM, 53 key 5250 Emulation. Wi-Fi (802.11b), Long Range 1D Laser, WindowsCE .NET, Color Screen, 64MB RAM/64MB ROM, 53 key 5250 Emulation. Wi-Fi (802.11b), Long Range 1D Laser, Windows Mobile 2003, Color Screen, 64MB RAM/64MB ROM, 53 key VT Emulation. Wi-Fi (802.11b), Long Range 1D Laser, WindowsCE .NET, Color Screen, 64MB RAM/64MB ROM, 53 key VT Emulation. 1 Year Bronze Service Plan with 3 day service center turnaround. 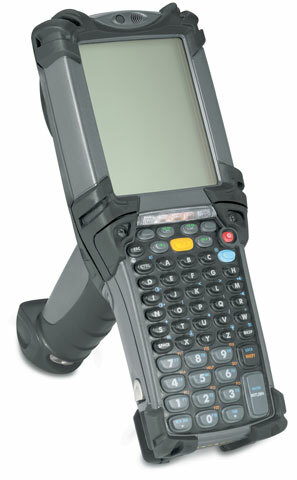 For part numbers beginning MC9050G and equipped with Color Displays.